Hannah and Joey’s ceremony was held in downtown Petoskey at St. Francis Catholic Church, and was followed by a beautiful reception at the Bay Harbor Yacht Club. 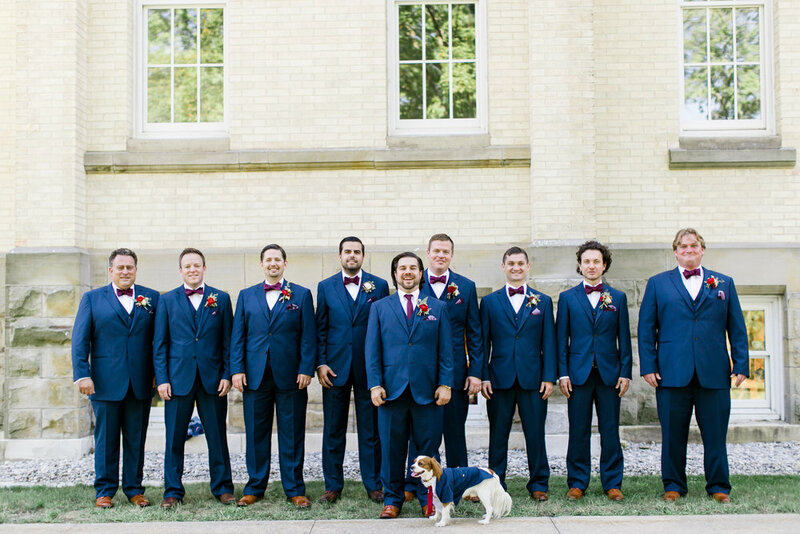 Although the distance between to the two venues is only a couple of miles, they decided to hire transportation for the wedding party after the ceremony. The Mackinaw Trolley Company was great for their large group and a fun way to arrive all together at the Yacht Club. Click HERE for the full gallery and check back Friday for more details from Hannah & Joey’s wedding! Read Monday’s Real Wedding feature on the big day HERE. One of best parts of planning a wedding is highlighting special memories that the bride and groom share together. Scott and Catherine met on the sailing team so it was particularly special for them to have a small touch of boating incorporated in their wedding. The reception was held at the Bay Harbor Yacht Club, a place they chose for its view and proximity to the water. After the ceremony, the wedding party crossed Little Traverse Bay via a vintage boat and arrived at the docks below the yacht club while all the guests had cocktail hour. Click HERE for the full gallery and check back Friday for more details from Bride & Groom’s wedding! Read Monday’s Real Wedding feature on their big day HERE.